What is Duquesne University STAGES? 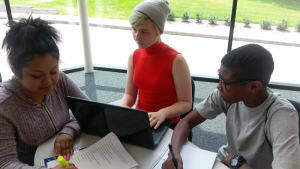 Duquesne University STAGES (Student Theater Arts Guiding Engagement & Success) brings teenagers living in the Greater Pittsburgh area to Duquesne University for a month-long theater arts summer camp. Students conceive, write, direct and perform in their own production. Students who wish to remain behind the scenes learn aspects of technical theater using state-of-the-art equipment. The camp, held in Duquesne's Genesius Theater, is staffed by Duquesne University students, alumni, faculty and staff. STAGES was created to make theater arts more accessible to students who may not otherwise have access to theater arts education in their schools and communities. We intentionally set tuition for the month-long program at less than many camps charge for one week. Additionally, any student who qualifies for free/reduced school lunch attends camp for free. STAGES ran their first summer camp in 2016 thanks to a generous grant from the McKinney Family Foundation through PNC Charitable Trusts. Students from Perry High School, Holy Family Academy, Neighborhood Academy and Pennsylvania Leadership Charter School participated in the camp. How does this impact those at Duquesne University? STAGES not only benefits the teenagers in the program, but also the Duquesne students, alumni, faculty and staff who gain valuable community engagement experience from running the camp. In 2016, two undergraduates and one graduate student representing both the McAnulty School of Liberal Arts and the Nursing School were provided valuable summer employment as camp counselors. 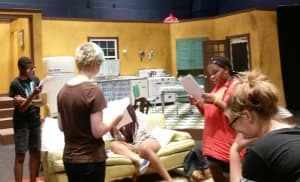 Long term, STAGES can also aid in collaborations between departments such as the existing collaboration between the theater and media arts programs. How does this impact the community? STAGES provides young people the chance to experience the theater arts as performers, writers and technicians. The overall goal is that the skills and self-discipline they learn at the camp will lead to measurable outcomes in collaboration/communication, self-esteem, time management and problem solving. In addition, the program exposes the campers to a college campus and allows them to envision themselves as part of the University community. These are opportunities they otherwise may not have. We received grant support to launch this effort last year, and we have received some funding this year, including from Cognizant via Maker Education Initiative (Maker Ed). However, we need additional donations to provide a robust theater camp experience with costumes, props, transportation, healthy meals and a DVD keepsake of the camp performance for each student. Donate: We hope you will choose to hit the "Give Now!" button and make a donation today. Gifts of all sizes will add up to help us reach our goal. Keep in mind how your generosity will impact both those at Duquesne University and the greater community. Spread the Word: Another way to greatly help this campaign is by spreading the word via social media, e-mail, text and word of mouth! Share this link (www.spirit.duq.edu/stages17) with anyone you know who is passionate about theater arts and ask for their support. Thank you for taking the time to read about STAGES and our crowdfunding campaign. We can't wait to keep all of our donors informed about the camp this summer! If you have questions about STAGES or this campaign, please contact John Lane, Director of Theater Arts, at lanej@duq.edu. 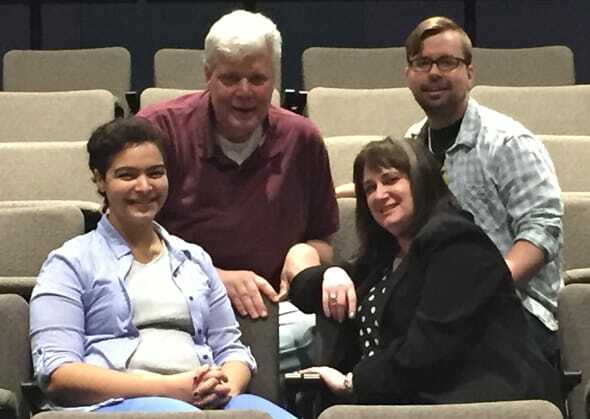 Duquesne University STAGES Project Owners: Front - Eva Diodati and Ro Vigilante; Back - John Lane and Justin Sines. Photo Credit: Nick Cipriano.